we challenge both members and non-members alike to climb the elevation of one of the great mountains of the world. This year we challenge you to climb the height of The Great Trango Tower! The Great Trango Tower boasts 20,623 feet of grandeur and has the tallest vertical face on earth! Gather together a team of five trusted climbers and test your skill, endurance, and camaraderie. For the entire month of February, we will track your elevation progress – the team with the most elevation gained wins! 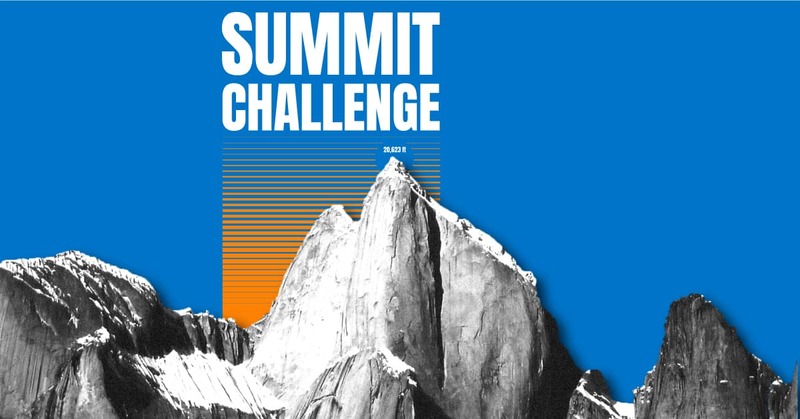 All contestants that reach the summit (20, 623 feet) will receive a Summit Challenge t-shirt. Team sign-ups end February 5th, gather your team now so you don’t miss any climb days. Every vertical foot counts! Sign up at the front desk. Open to all climbers with applicable plan or pass. Scorecards must be turned into the front desk after every climbing session. Boulder problems = 13 feet elevation. Roped climbs = 26 feet elevation. Maximum of 10 route/problem climbs per session. One challenge per person per team. Each challenge must be witnessed and initialed by a fellow climber for the points to count. If you needed to take a picture for a challenge, show the picture to a front desk staff member when you turn in your Bonus Challenge sheets. Check back on February 1st for the first weeks Bonus Challenges and contact the front desk for any questions.